Independent laboratory tests prove the Rainbow Cleaning System beats the competition in filtration efficiency. By combining its water-based/separator technology that traps 99.997% (by weight) of typical household dirt, a “brushless motor” and a HEPA Neutralizer, the Rainbow achieves what other products cannot. 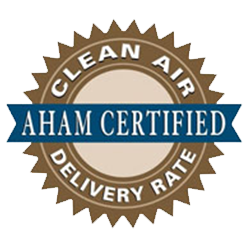 AHAM CertifiedAHAM Verification Programs have been an important part of AHAM services since the Association’s inception. Verified appliances carry an AHAM Mark on the unit or its packaging. This Mark assures consumers, retailers and other interested parties that a product may be selected at any time for verification testing, and that the product’s energy consumption rating is consistent with the energy consumption measured against standard test methods. The Programs provide a uniform and commercially practical verification of certain performance criteria for each product. An independent laboratory under contract to AHAM performs the verification testing based on a specified test procedure. The Association of Home Appliance Manufacturers (AHAM) certifies that the Rainbow is a proven air cleaner designed to reduce air pollutants that contribute to poor indoor air quality. 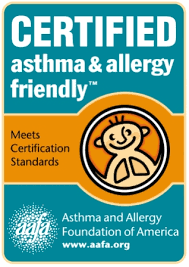 Asthma and Allergy Foundation of America CertifiedCertified products have been found to meet or exceed the independant asthma & allergy friendly™ Certification Standards. In addition, all of the products’ allergen claims have been reviewed and found to be accurate and clear for consumers to understand and the products can be identified by the presence of the distinctive Certification Mark on the packaging and promotional materials. Where applicable, the products also include clear, concise care instructions outlining how to maintaing the items in a reduced allergens.